Equities start the day lower….actually screw it, I need to invoke Special Order 86 here. When Special Order 86 is implemented we scrap the regular recap and go with a full on stream of consciousness writing style. I do this for special events such as the Flash Crash or Lehman brothers because the regular format is too boring for the clown fiesta I just witnessed. You’d think re-entry after vacation would be gentle right, a nice long runway where you get back in the groove. But not for me…no….Mr A gets thrown into a fire pit of China imploding and Oil trying to trade for a dollar. Overnight looked pretty grim, down 2%ish. Ok, fine, it happens, markets can have a bad night from time to time. But last night was Krusty the Klown krazy as the Shanghai Composite fell 8% and our futures fell 4%. I honestly can’t remember the last time futures were down 4% pre mkt, maybe the financial crisis but usually those days started out ok and then fell apart. Today started out horrible and then the open was even worse. Let’s look at HCA to give you a bit of perspective about how the day started. HCA has been a huge winner this year, in fact it’s been a huge winner for a while now. Hospitals…I mean hospitals are popular places for, you know, sick people and such so they make a lot money. Anyway, here is an updated chart of HCA after today. Are you kidding me…really? You’re gonna do that to a big hospital group? This isn’t some startup that just reported zero revenues and loss of 3 million mobile subscribers this is an honest to goodness medical conglomerate. You know what? There are more charts that look as dumb as HCAs. CL, COST, GE, CVS, SBUX, and KR (it’s a grocery store for crying out loud) pick any of those and you will see insane moves. 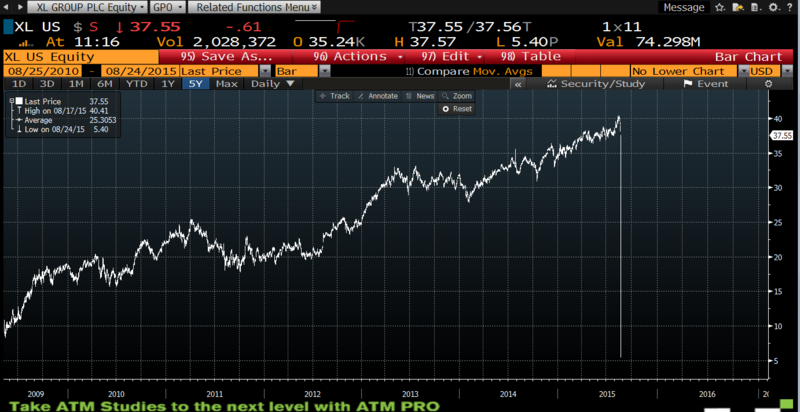 Colgate….they sell toothpaste and freaking dish soap and the stock was down 20% on the open. Sigh. So what’s the main takeaway from the morning? That 1) volatility can be off the charts at times, we’ve been lulled to sleep 2) the market can still break, huge stocks like GE can fall 20% out of the blue and 3) good brokers save you from these idiotic moves or at least help you navigate them. It kinda looked and felt like Flash Crash 2.0 my friends. By the way, next time we see transports and cmtdys sell off we need to listen with both ears, They literally told us this was going to happen. So the open was nuts, and it felt like full on capitulation to me. But then we started rallying in a big way. The Dow was down 1000 points after the open, by noon it was only down 200 points. 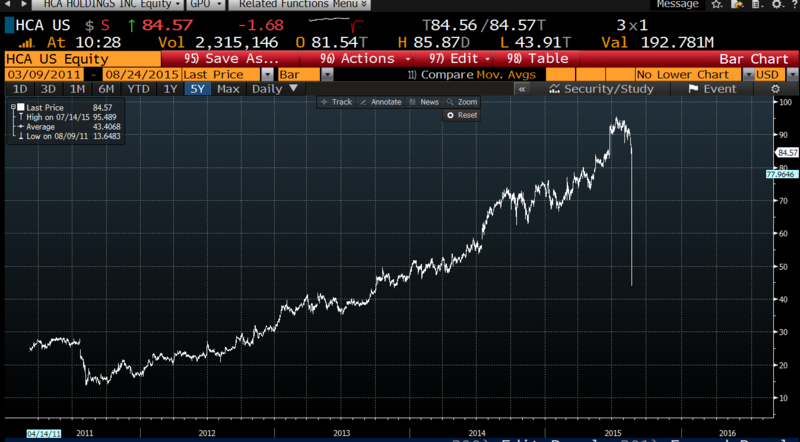 Apple had a 150bn round trip on its market cap, 150 BILLION. This is the largest most liquidly traded stock in the world and people couldn’t decide on its market cap to within 150 billion dollars. Billion…with a B. Did I mention this was going to be stream of consciousness because I’m rambling here! Look at the chart of XL, does that look like normal price discovery to you? Sigh…..these markets. I have to relay this awesome quote by @cullenroche before we move on: “The stock market is the only market where things go on sale and all the customers run out of the store”. How good is that? The lunchtime rally fizzled out a bit and by the time the bell rang we closed down 4%. Puking in the gutter, face down, had 82 tequila shots and a 6 pack of taco bell tacos ugly. Only THREE STOCKS in the S&P closed up by more than 1% (GAS, SWKS, and GMCR) so the pain was real. Pardon my french but ZUT ALORS was that a bad day. The kind of day where hitting bids gets you nothing. Ugh. So here’s the deal: I said it was “all noise until we break 2,050” and now we have, so it’s not noise anymore. The market has all kinds of technical damage and this palpable uncertainty won’t resolve itself quickly. We have officially entered a correction. Will the Fed hike this year? Most people would say no but I still think there’s a decent chance they do (Dec not Sep). I don’t think they care if financial assets quake from time to time, they want to begin some process of normalization however small that may be. Remember how we were trading in the tightest range ever? 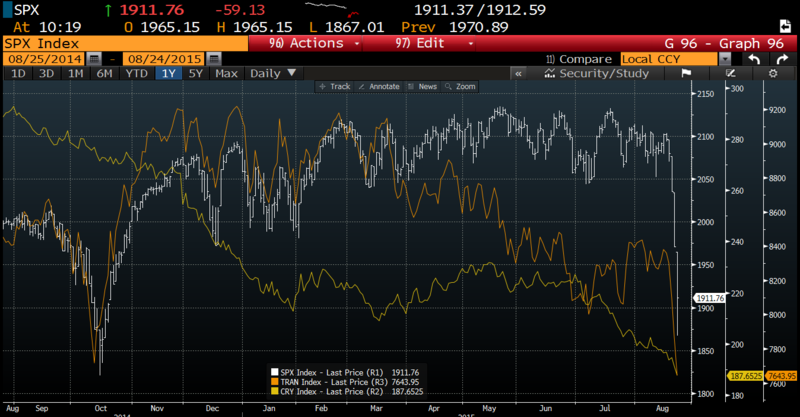 Not so much anymore, but this is why they call them “Risk assets” so embrace the madness. 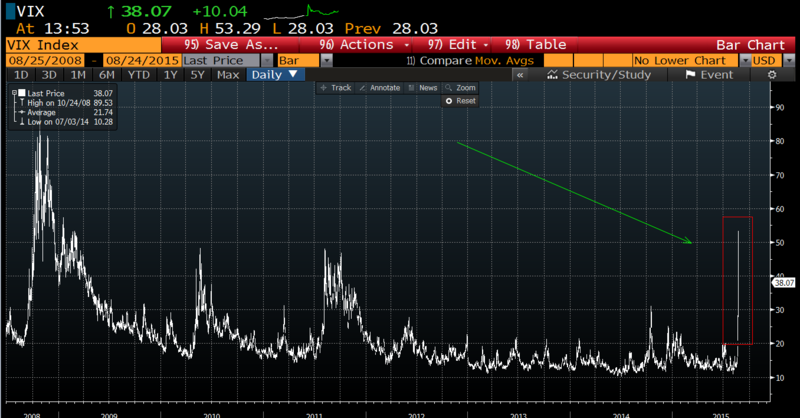 I’m going to leave you with one last chart…of the VIX….going back to 2008….and wonder…. W…T…. Final Score: Dow -358bps, S&P500 -394bps, Nasdaq -382bps, Rus2k -390bps. I’m too wiped out for links, I might fall asleep in my car before driving home. Let’s move to the big finish. I looked for a video that best represented what it’s like to be in the market right now. I thought I did pretty good job all things considered.